The European Driver of the Year for 2005 was a far from foregone conclusion. It was a mark of the quality in depth in European racing that record-breaking seven time Le Mans winner Tom Kristensen didn’t make the top four in this vote. In LMP1, Emmanuel Collard was recognized for his searing pace at Le Mans and his championship winning LMES form aboard the Pescarolo C60 Hybrid, while Allan McNish drew praise for his signature style of gutsy and fast, faultless driving in the ORECA Audi. LMP2 pace, racecraft and a Le Mans class win earned RML MG Lola star Thomas Erdos a mention here too. In GT2, Xavier Pompidou was rightly acknowledged for his stunning pace and the efforts of GT2 class winner Marc Lieb, in the FIA GT Championship, the LMES and the Le Mans 24 Hours, were recognized with a joint second place here, alongside GruppeM team-mate and Porsche Cup victor Tim Sugden and Zytek star Hayanari Shimoda. The winner though was a man who made his car fly whenever he climbed aboard. Whether it was the Aston Martin DBR9 he piloted at Sebring, Le Mans, the Spa 24 Hours and to a race win in the Tourist Trophy round of the FIA GT Championship, the Schnitzer BMW M3 GTR he took to a fourth win at the 24 Hours of the Nurburgring, the MenX Ferrari 550 in which he gave a virtuoso performance in the Istanbul round of the LMES or the Larbre Ferrari 550 he guided to an FIA GT championship win for Gabriele Gardel. 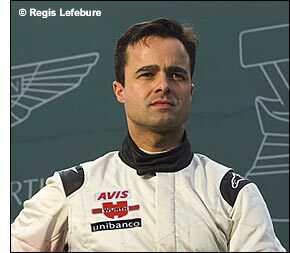 Pedro Lamy is the dailysportscar.com European Driver of the Year for 2005.